Wool has such long tradition as a natural material and particularly as a floor covering material because its very structure makes it ideally suited to this purpose. Even before 500BC it is thought Persian nomads knew about the use of knotted carpets with their herds of goats and sheep providing high quality wool for this purpose. Wools rich history as a floor covering material means your wool rug will lend an air of unparalleled authenticity and class to your scheme that a man made fibre simply cannot match. At Rug Couture we can currently offer in excess of 1200 colours because of Wool's high protein content and resulting natural affinity for dye. Wool when dyed excels in both its depth and clarity of colour, two characteristics essential to any stylish piece. Because the colour is literally locked into the Wool fibres of your rug it can't be rubbed off by walking upon it or through the movement of furniture meaning your Wool rug will retain its stylish good looks for longer. 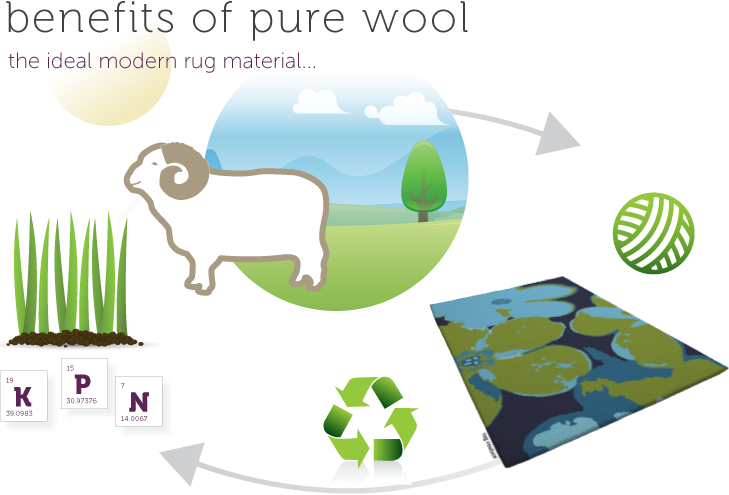 Wool is an incredibly sustainable floor covering material as it is produced by sheep fed on pastures fuelled by sunlight. This is reflected in the amount of energy it takes to produce Wool which is about 1/8th of that used in the production of Nylon. Once Wool is harvested and spun it can, at the end of its long life cycle, be safely returned to the ground or recycled. Under the right conditions it is totally biodegradable as Wool is made from the very building blocks of life; amino acids which, on bio-degradation release essential plant nutrients such as potassium, nitrogen and phosphorous back into the soil. Flock rotation and good land management ensure the sustainability of sheep farming. Wool is springy and its fibres can be stretched by more than 35% and still easily return back to their natural shape which means that wool rugs will last for many years without showing signs of wear and tear so you will quickly recoup any investment in your wool rug. Wool rugs or carpet actually prevent heat loss reducing your heating energy requirements. With up to 10% of heat being lost through an uninsulated floor a Wool rug with its excellent insulating properties will certainly help to reduce this figure. In summer the converse is true and your Wool rug will prevent heat rising through the floor and keep your room cool and comfortable. Wool is naturally 30% more stain resistant than even the best synthetic fibres due to the coating of light wax on each fibre, making your rug easier to clean. Your Wool rug will trap particles like dust, pollen and fungal spores keeping them out of the breathing zone. These are not easily dislodged by normal use so can then be safely removed by vacuuming. Wool's natural light wax coating will also actually help to stop stains penetrating the wool leaving soiling near the surface where it can easily be removed without the use of harsh chemical cleaners. Due to its high protein and moisture content Wool is naturally flame retardant and exhibits a lower flame spread than synthetic fibres. It also produces lower smoke emissions so that it doesn't create such dangerous levels of carbon monoxide and other toxic fumes. This natural moisture content means Wool is also resistant to static electricity. The natural crimp in Wool fibre makes it springy so that as you walk on your Wool rug the crimp coils and uncoils acting like little springs cushioning your joints and any falls. Wool also acts as a natural filter with research showing it can actually absorb indoor contaminants and purify the air of harmful gases. Wool will absorb up to 1/3 of its own weight in water vapour without feeling damp. Any excess moisture generated while showering or cooking is wicked away reducing condensation and mould which can cause respiratory problems making Wool a very safe surface for you and your little ones.